Malvern Borough recently completed a Multimodal Transportation Study that evaluated existing issues in the borough and identified ways to improve the transportation network. Primary concerns were pedestrian travel issues, regional multimodal connections, cut-through traffic, and safety for all transportation modes. Recommendations were formulated to improve access for all users, encourage non-vehicular traffic, improve safety, and provide the opportunity to improve the health and well-being of residents. Recommendations focused on strategic improvements to seven intersections to address pedestrian, bicycle, public transit, and traffic issues at each location. The study also addressed providing convenient and safe travel for all through organizational, financial, regulatory, and educational options. Malvern Borough Council accepted the study, which was prepared by McMahon Associates, at its September 4, 2018 meeting. The project was funded through a Chester County Vision Partnership Program (VPP) cash grant and Malvern Borough funds. View the plan. In the northern tip of the county, Elverson Borough adopted new zoning and subdivision and land development ordinances earlier this month to implement their 2014 comprehensive plan. Through a VPP technical services grant, Chester County Planning Commission staff guided the Borough’s task force through the updates, which focused on promoting consistency with the 2014 plan, updating natural resource protection standards, promoting growth that is consistent with the borough’s character, simplifying plan submission and content requirements, and revising and enhancing development design standards. The updated ordinances should help Elverson remain “The Greatest Square Mile in Pennsylvania.” View the borough’s website for more information about the new ordinances. Honey Brook Borough and Honey Brook Township adopted zoning amendments earlier this month that promote consistency with their joint comprehensive plan, which was adopted in 2015. Each municipality retains its own individual zoning ordinance, with both addressing consistency with the joint comprehensive plan as necessary. Updates focused on accommodating diverse and appropriate economic development while preserving historic resources, natural resources, agricultural lands, and other open space. Brandywine Conservancy assisted the borough and township with the process, and previously assisted them with the joint comprehensive plan. A combined task force, which included representatives from both municipalities, was guided by the Conservancy through the ordinance update process. The project was funded through a VPP cash grant, township funds, borough funds, and a grant from the Brandywine Conservancy. View the borough’s website and the township’s website for more information about the zoning amendments. While a handful of VPP projects are wrapping up, several others are beginning. 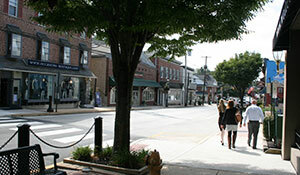 Through VPP technical services grants, Chester County Planning Commission staff is working with North Coventry Township on a comprehensive plan and will assist Parkesburg Borough with a comprehensive plan and revitalization plan beginning in October. Cash grant projects funded through VPP that have recently begun include the Plum Run Corridor Greenway Study in East Bradford Township and a Pedestrian Accessibility Plan in Phoenixville Borough. Round 2 of the 2018 VPP is underway, with award recipients expected to be selected in mid-October. As has been common in recent cycles, this round is very competitive, with multiple applications requesting awards that exceed the available funds. The Chester County Commissioners established VPP in 1996 to promote cooperation between the county and local governments in the implementation of the county’s comprehensive plan. Adoption of Landscapes3 is anticipated to modify VPP and may delay the first round of 2019, as the program manual and application are updated. Look for information on the 2019 program details later this year and into 2019 on the program webpage.